Come on an animal adventure and explore the intricate biology, zoology and physiology of the world’s most spectacular creatures! 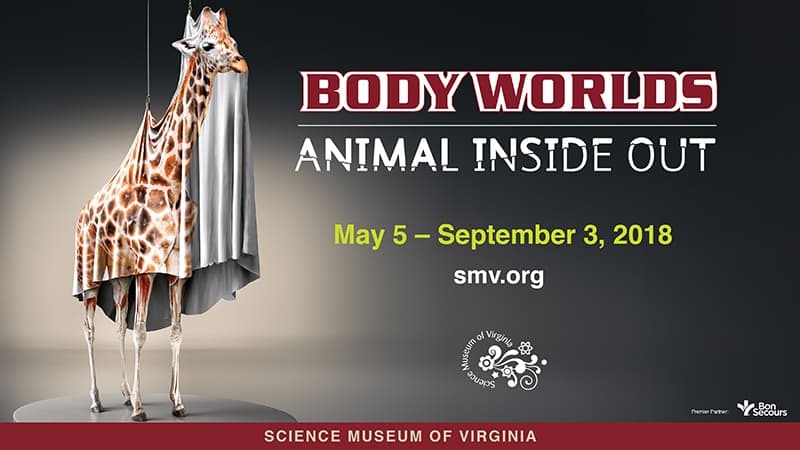 Now open at the Science Museum of Virginia, BODY WORLDS: ANIMAL INSIDE OUT allows guests see what lies beneath the surface of animals large and small – using the amazing science of Plastination invented by BODY WORLDS creator and anatomist, Dr. Gunther von Hagens. Plastination is the groundbreaking method of halting decomposition to preserve anatomical specimens for scientific and medical education. The entire process to create a single large animal specimen can take thousands of hours over the course of years to complete. ANIMAL INSIDE OUT showcases more than 100 plastinates – from complete bodies to tiny specimens. Discover animals both exotic and familiar from land, sea and air and learn how their organs and systems compare to one another, including humans. Featuring the powerful ostrich, the rarely seen giant squid; a magnificent bull, with its heart five times the size of a human’s; and a reindeer, with hooves that adapt to the changing seasons! One must-see highlight of the exhibition is the world’s tallest mammal, the giraffe. Standing up to 20 feet tall, this spectacular specimen took over two years and 20,000 hours to complete. This giant of the animal kingdom has a massive heart, weighing in at 22 pounds; a 20-inch-long blue tongue, used to grasp and pull leaves off of tall trees; and a dense network of arteries in its neck, stretching over 6.5 feet long. But even with such a long neck, the giraffe has seven vertebrae in its neck, just like a human. Come discover more fascinating facts about the animal kingdom at ANIMAL INSIDE OUT! The exhibition will be on display May 5 – September 3, 2018. The Science Museum of Virginia is currently the only venue in the south-eastern part of the United States scheduled to host the show. Don’t miss your chance to see these fascinating animals up close. For ticket pricing and additional details, visit smv.org.